Nowadays, implementing a strategy to insulate your organization’s data and production infrastructure from the seemingly endless list of new cyber threats has to be a priority. 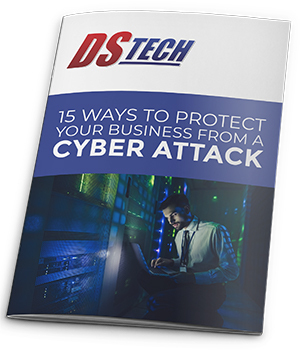 At DS Tech, we understand what is at stake; and, that’s why we’ve created our 15 Ways To Protect Your Business From a Cyber Attack! infographic. In an easy-to-use checklist, we outline 15 ways that you can keep your organization’s network and infrastructure free from threats, and working as intended. We know it’s not always easy to keep your guard up, but with the nature of today’s threats, knowing how to implement and run an effective cyber security strategy is the responsibility of every business owner. Your organization absolutely needs its IT to be reliable and your data to be secure if you want to properly navigate the current threat landscape. Get started doing all you can to keep your organization’s data and network safe today with help from the IT professionals at DS Tech. To download our free 15 Ways to Protect Your Business From A Cyber Attack! infographic now, simply fill out the form. At DS Tech your time and privacy are as important to us as they are to you. We use the information you provide under our legitimate interest to make sure you view topics of interest to you.